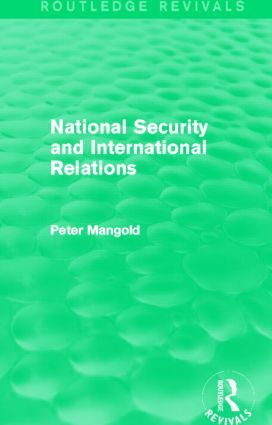 First published in 1990, National Security and International Relations provides a concise analysis of the problem of national security in the twentieth century. It examines the criteria by which states decide what level of security they want to seek in an uncertain and essentially Hobbesian world, and why some states tend to underinsure, while obsessively insecure states overinsure, frequently making others more insecure in the process. In the wake of two world wars and the threat of nuclear destruction, Peter Mangold argues that war was becoming as much a source of insecurity as the intentions of other states. It then explores the different approaches attempted during the twentieth century to ameliorate or ideally escape from the security dilemma. These range from international regimes, to the restructuring of the international politics of Western Europe so as to substitute cooperation for conflict, and U.S. and Soviet attempts to render nuclear competition safer through arms control and confidence building measures. Of special value to students of International Relations and Strategic Studies, this book will also interest those keen to understand the challenges embodied in Gorbachev’s ‘new thinking’ in foreign policy.